The data types provided by software are called simple data types. It is a fixed length data type used to store the character data. 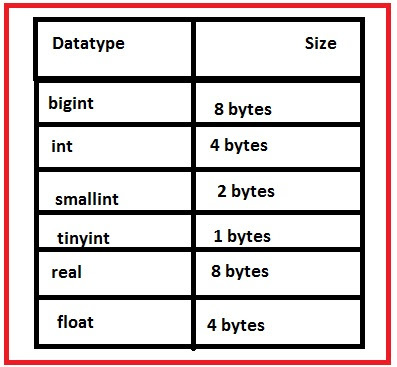 Maxi size is allowed for n is 800 bytes. It is a character data type used to store the character data. It is variable length data type. Maxi size is 800 bytes. It is the fixed length charcter data type used to store the character data. Maximum size of 'n' is 400 bytes. It is the variable length character data type used to store the character data. Used to store date and time values. It is used to store date values from 1st January 1753 to 31-December-9999. Default size is 8 bytes. Default size is 4 bytes.